I haven’t spent a lot of quality time at Junkyard Blues lately, but I have been around. I’ve caught some shows and done some wandering around. I felt like a stranger, but I caught the Stratman (DJ Straton Tigerpaw) taking the lead for the first hour of the Miss Luci Show on Saturday night. I enjoyed Strats’ show but I also noticed something in the distance that I planned to explore in the morning. You might snicker at the notion of “artistry” referring to a junkyard, but this Junkyard isn’t just some place where junk was piled up. Junkyard Blues is a large group of well thoughtout, well managed sims. And the sims are woven into the theme of laid back Gulf Coast life and play. Anyway, starting today, I’m doing a series of posts that I beleive will prove my assertion. And to kick things off, I’m going to start with one of the outter sims. Yeah, where “others” have been at work, adding to the overall Gulf coast theme. And my first discovery was a wildlife sanctuary open to the public, and owned by Salena Sideways. Following are a couple pics from the collection. When I landed, there was a sign saying that the area was open to the public, but visitors need to realize that all of the outter sims are owned by private individuals and not just Kiff & Dina. If you’ve ever been in swampy, wetland area, you’ll feel at home immediately. Salena is an excellent landscaper and combined authentic flora and fawna, that creates instant immersion and enchantment. Just don’t fall in the water because there are some critters with big teeth in there too. 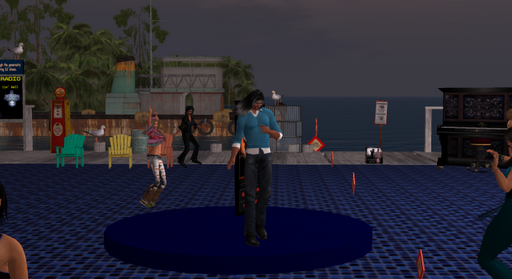 Salena owns the Pompano sim and the entrance to the sanctuary is just off the eastern docks of Junkyard Blues South sim. Next, the JY beach and marina. This entry was posted in Features and tagged Beautiful Regions, Photography, Second Life. Bookmark the permalink.